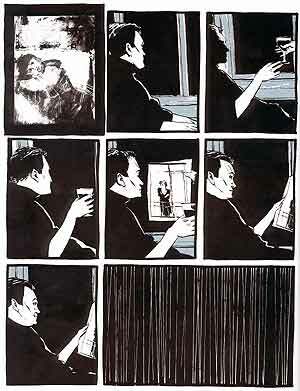 Ponderous, melancholic, intense, Dave McKean’s monster of a graphic novel is best read slowly over a series of overcast days. Its characters are odd and sometimes unsettling, making them, if anything, more magical. It’s a great, weird read that feels like a quiet novel in comic form, choosing to include moments of silence that most comics would edit out for brevity’s sake. The concepts are intriguing and the art styles, switching from sharp lines to out of focus photographs to drawings within photographs, helps the story maintain its immense depth of strange sadness. If you’re in search of a book about lost artists and the nuances of love and music, then give Cages a read and let me know how you feel when you’re done. This looks like a truly stunning visual presentation. The cover is so vibrant and dark all at once and your description of the interior images leaves me believing that this is something quite unique. Thank you. Thanks, Toi! It really is a visual treat.